Quick Links: MicTuning 6 switch panel - anyone have one? Add a Circuit Question (2012 Tacoma TRD) Adding Backup Camera Display 2 meter Ham Radio installation New Oil Filter Comparison Should I replace my water pump? Hardwired Sirius Radio - Where's the 12v? Discussion in 'Technical Chat' started by jlleiber, Oct 5, 2010. Hello all. I hardwired my sirius sportster to the back of my 2010 head unit. To do so, I spliced into the thin green wire on the head unit because it was called out as "ACC" on the wiring diagram that I found. However, the sportster is now controlled by my headlights and not just the "acc" on the ignition. In other words, I have to at least have my running lights on to get power to the sportster. Any ideas on why this is or to which wire I should splice to instead? The green wire on aftermarket radios is usually reserved for the power antenna so that's why they call out for the green on your truck and since you don't have one that's why yours is screwed up. I hard wired mine as well, but I have an aftermarket radio. I do not remember what I wired it to, but if this isn't answered by the time I get home Ill post up the directions. I just gotta check. I did to many wire mods within the same time period so my mem is fuzzy. Also, I have seen people tap into their fuse box. Has anyone done this successfully or have a link to a write-up on it? Skip the fuse box and wire it into the cig lighter. Of course fuse it, but that is where I normally take power for something small like a sirius tuner. I tried looking at that but the cig lighter looks difficult to get to. Or is it easy to remove? Also, I'm a little green at this, so how would I go about fusing it and with what size fuse? This is what I did too. But the cig lighter already is fused, so its good to go. Hi Gang, looking for help with this as well. I've recently insalled a new Sirius with a sharkfin adapter and hid my wires well. The final step is to hardwire my power but I don't know where to even begin. Is the lighter the place to go and if it is how do you do it? I did this mod about a year ago, just forgot to post about it. Check your Sirius model, mine is a Starmate I think that needed less than 12v going to it to work correctly. You can create something from radio shack, but this kit to drop the voltage is better. I had enough cable with the kit that I attached it to the wires coming out of the fuse block under the steering wheel. Used a small voltmeter to find a fuse that was on only when the key was on ACC or Run. That way it doesn't drain the battery, it shuts off with the vehicle. I forget what color the wire was will look and let you know. I also recommend getting a RF connector that allows you to connect your sirius in through your radio's antenna connector on the back. the wireless transmitter doesn't work very well. Here is a pic although its turned 90 degrees for some reason. The blue and white wire on my 07 Taco provides power as I stated above. I used the red piece of plastic to tap into the existing wire without having to cut it. These taps can be bought at radio shack. The black plastic part on the right is a fuse block from the hard wire kit I have. That way if the sirius is shorted and draws too much power, the fuse will break the circuit vice catching the interior on fire. 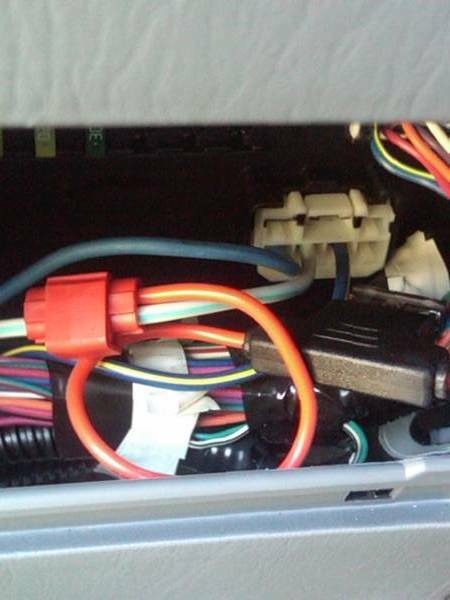 You can hide the rest of the hardwire kit easily up under the dash. Armored, thanks for the info.....That's what I'm looking for.